A week-long film festival celebrating the brightest talent in French language independent cinema presented by the Film Society of Minneapolis St. Paul at the St. Anthony Main Theatre. Lumières Françaises introduces an exciting new generation of rising francophone talent on both sides of the camera, from rebellious comedies to exquisite dramas, and vivid documentaries. All films presented with English subtitles. 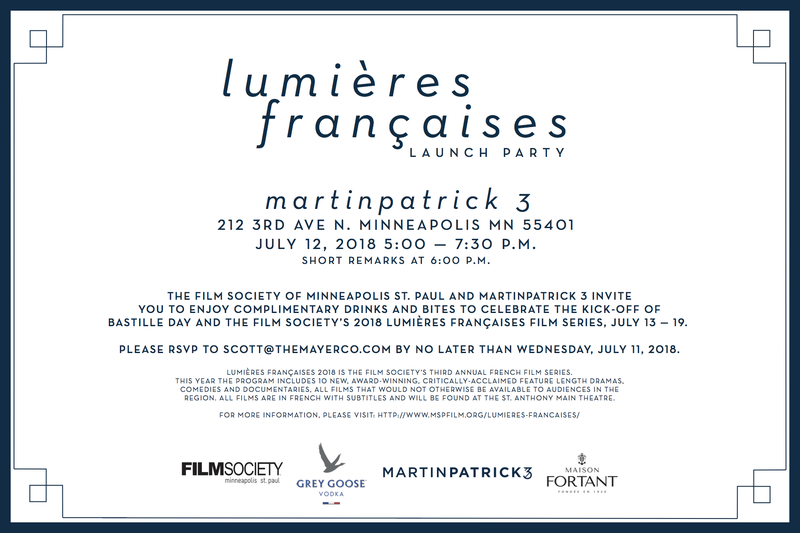 Please join us on Thursday July 12th at Martin Patrick at a Launch Party for the 2018 Lumières Françaises! As light as a feather yet anchored by the melancholy weight of approaching change, Before Summer Ends is the bittersweet chronicle of a single summer in the life of three Iranian students living in France, an utterly unique, beguiling mixture of documentary and fiction in the perennial form of a road movie. Winner of the César Award (the French Academy Awards) for Most Promising Actress - Camélia Jordana. Neïla Salah (Jordana) lives in the projects and is a brilliant law student at a university in an upscale Paris neighborhood, where she takes classes by the famous and provocative Pierre Mazard. To redeem himself for some off-color remarks, Pierre agrees to coach Neïla for a prestigious rhetorical competition. Today is Pierre and Helena's big day. From the preparations to daybreak, we get a behind-the-scenes look at a wedding party through the eyes of the people working on it. They will all have to count on their one common quality: they know what it means to throw a good party. Fortuna is a 14-year-old Ethiopian girl has had no news of her parents since she arrived on the Mediterranean shores of Lampedusa, Italy. With other refugees, she is given shelter for the winter in a Swiss monastery and there Fortuna meets Kabir, a 26-year-old refugee with whom she falls desperately in love. Their relationship develops in secret until the day Kabir mysteriously disappears. In Bed with Victoria is a devastatingly funny romantic comedy that sees Victoria, a thirty-something lawyer juggling a successful career, two young children, a busy online dating life, while trying to keep a crazy ex-husband regularly from posting internet updates of his tell-all memoir about their marriage. Fresh from yet another breakup, Océane is jogging in the woods when she spies the beautiful Cécile doing gymnastics. All it takes is one failed headstand for Océane to jump in and offer her healing touch. Before long, she is convinced she has met the woman of her life. Simon is a disillusioned violinist. He has recently gone through a divorce and found a job teaching orchestra in a working-class neighborhood of Paris. Arnold is a shy student who is fascinated with the violin and discovers that he has real talent for it. With Arnold's raw talent and the joyous energy of his class, Simon gradually rediscovers the joys of music. Out on parole, Nas has to toe the line while working at his older brother Arezki’s bar Le Prestige to avoid being thrown back in prison. But wants to get back into promoting parties and Le Prestige’s location in Pigalle, the heart of Paris’ bustling nightlife, is an ideal calling card, sending the brothers are on a collision course that started long ago. In November 1918, before the Armistice, Edouard Pericourt, a gifted artist, saves the life of Albert Maillard, a humble bookkeeper. The two men have nothing in common apart from their experience of war and their hatred for Lieutenant Pradelle. While Pradelle goes on to make his fortune on the backs of the dead, Albert and Edouard, condemned to live, come up with their own monumental scam. Speak Up follows a group of college students preparing for Eloquentia, an oratory competition, through an intensive six week workshops. Directors de Freitas and Ly create an inspiring portrait, by turns riotous, by turns poignant, of a young generation of every creed and color brought together by a shared commitment to the French art of rhetoric. *These films are part of Young French Cinema, which is a program of UniFrance & the Cultural Services of the French Embassy.